Cover Story | The ACC was founded during what is often called “The Golden Age of Cardiology.” In his book “American Cardiology: The History of a Specialty and Its College,” Bruce Fye, MD, MACC, details how in the period following World War II, factors like the increasing prevalence of heart disease, the advent of federal research funding, breakthroughs in technological innovations, and the growing availability of health insurance worked together to shape cardiology into a major academic and clinical discipline. As these national meetings grew in size and popularity, the ACC held its inaugural three-day symposium at Peter Bent Brigham Hospital a decade later in 1961. Also that year, ACC President Eliot Corday, MD, MACC, sought and received federal funding for the first international circuit course to Taiwan and the Philippines. The U.S. Department of State saw immense value to these so-called “medical Peace Corps” and began underwriting some of the expenses of these educational endeavors. The program was so successful that over the next five years 44 countries were privy to 17 circuit courses. In addition to live educational courses, the ACC also made it a goal to disseminate the latest cardiovascular information directly to its members. In 1958 the American Journal of Cardiology made its debut under the leadership of Editor Simon Dack, MD, MACC. This precursor to the Journal of the American College of Cardiology was well received and had approximately 6,000 subscribers within the first two years. Ten years later the College launched an audiotape journal called ACCESS (now called ACCEL) featuring recordings from the annual meeting, symposia and reviews of key articles from print journals. The advent of a new law signed by President Lyndon B. Johnson establishing Medicare and Medicaid in 1965 caused the ACC to expand its focus to include advocacy in addition to education. That year the College moved from New York City to Bethesda, MD, in order to be closer to the National Institutes of Health and the nation’s capital. Soon after, the College’s Government Relations Committee formed and the ACC assumed an active role with legislators, advocating for physicians and their patients. A decade later, ground was broken for the ACC’s Bethesda headquarters, dubbed Heart House by then President E. Grey Dimond, MD, MACC. As cardiovascular research continued to take off throughout the 1970s it became clear that cardiovascular professionals needed tools that translated science into practice. The ACC and the American Heart Association (AHA) answered this call in 1980 by initiating a unique partnership to develop clinical guidelines. The first guideline on Pacemaker Implantation published in 1984. Since then, the two organizations have developed 23 guidelines with a total of 3,337 recommendations. It was in the late 1990s and early 2000s that the College focused on encouraging greater participation by women and minorities in College activities. The College also started opening its doors to other members of the cardiovascular care team, including nurses, nurse practitioners and physician assistants. This member category has further expanded over time to include practice administrators, training directors, pharmacists and cardiovascular technicians. Also during this time, the ACC moved its headquarters from Bethesda to Washington, DC. It also launched its Political Action Committee (ACC PAC) to increase the political power and reach of the College. In addition, the College continued to expand its reach internationally and started developing member sections and councils around cardiovascular specialties and topics and other professional areas of interest. Today, with more than 40,000 members from around the world, the College is once again facing a crossroads in the midst of a constantly changing health care environment. Rapid advances in science and technology, uncertainty about systems of medical care delivery and growing demand for cardiovascular care around the globe present extraordinary challenges and opportunities for cardiovascular medicine. Many of the challenges affecting the College and its members are remarkably similar to those faced over the last 65 years. Embracing previous successes and learning from those who came before will ensure the College continues to grow and serve as the primary home for the entire cardiovascular community for another 65 years and beyond. Read more about the legends in cardiovascular medicine and the faces behind the creation of the ACC in a new book available at ACC.14 in Washington, DC. 1. Lüderitz B, Holmes DR, Harold J. 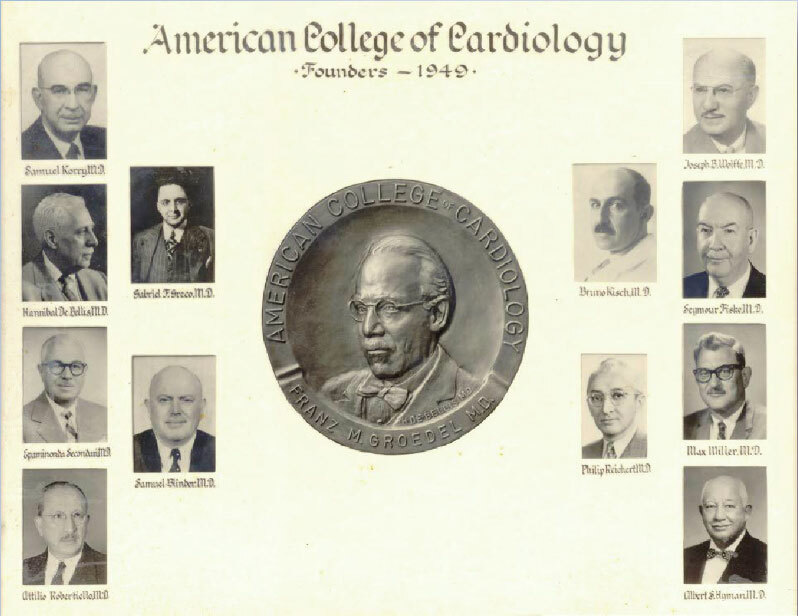 The History of the German Cardiac Society and the American College of Cardiology and Their Two Founders. J Am Coll Cardiol. 2013;61(8):802-807. doi:10.1016/j.jacc.2012.11.043. 2. Fye, W.B. American College of Cardiology: The History of a Specialty and Its College. The Johns Hopkins University Press. 1996:186. 4. Weintraub, WS, et al. The American College of Cardiology National Database: Progress and Challenges. J Am Coll Cardiol. 1997;29(2):459-465.